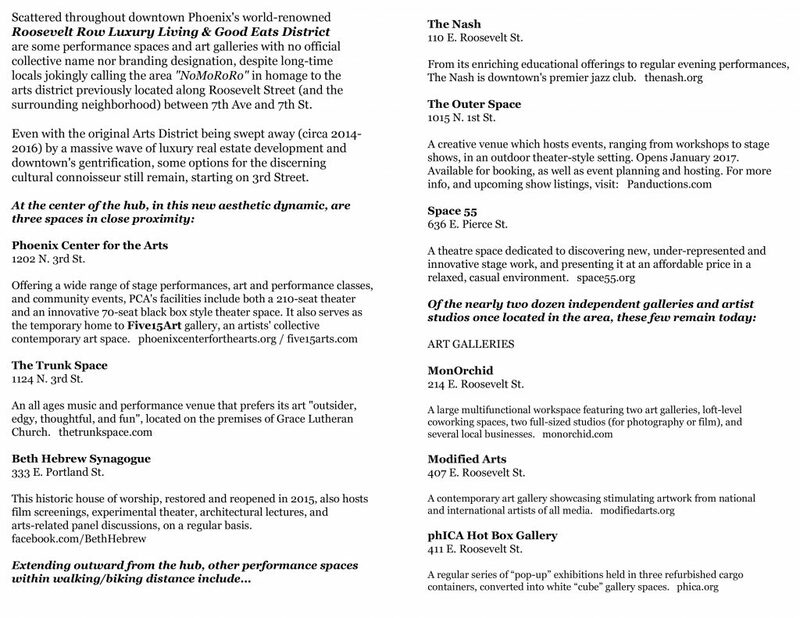 In spite of the galleries and venues that are left, there is less and less space for actual artists and musicians. You know, somewhere they can sleep, afford lunch, perform, hang paintings or otherwise be creative. What little is left downtown is quickly being shoved elsewhere. We sat down (via a virtual reality email chat relay called GeeMayle) with Pete Petrisko, whose most recent project hopes to rebrand ‘RoRo’ into ‘NoMoRoRo’—the ‘Luxury Living and Good Eats District.’ Using stickers planted on street lights and brochures documenting the few actual art venues left, Petrisko hopes to address how downtown businesses are exploiting artists, rather than helping them. Let’s start with what prompted you to start this project. Pete Petrisko: When galleries fall like dominoes, replaced by luxury housing, restaurants and high-end retail; when the number of galleries & studios in the area number less than half of what was there five years ago; when we’re in the midst of a creative brain-drain (I lost track of all the artists leaving downtown when that number hit double-digits, over a year ago); when artist-affordable housing is built in Mesa because that city proactively engaged with Artspace to get it built, while the City of Phoenix never followed up with the organization after a presentation here; all these things lead to one conclusion: Continuing to call Roosevelt Row an “Arts District” at this point might be the greatest bait-and-switch scheme Downtown Phoenix has ever witnessed. 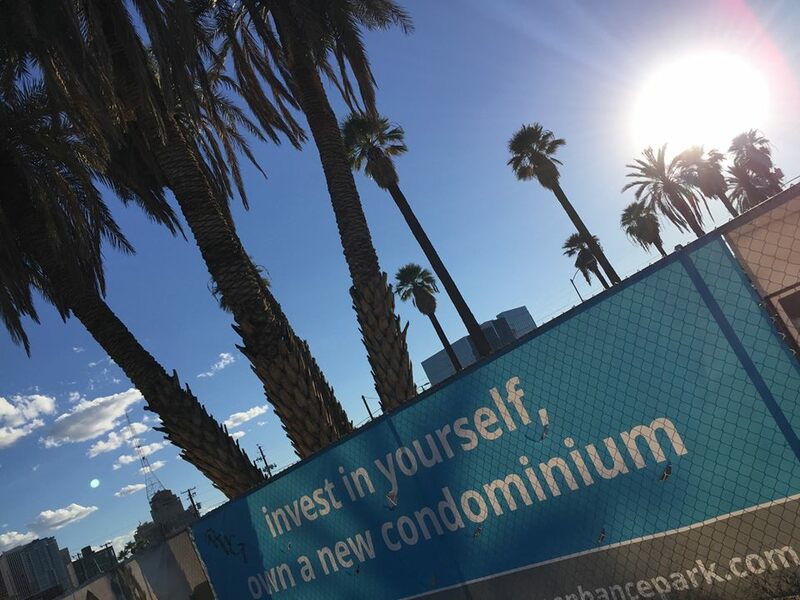 For better or worse, the phrase “Arts District” has turned into a marketing tool, with a hollow center, to sell more housing (and a “lifestyle”) in an area where the artists themselves can no longer afford to live. That might be good for developers, and the city’s national profile, but reads like a sick joke to the creatives displaced in the process. 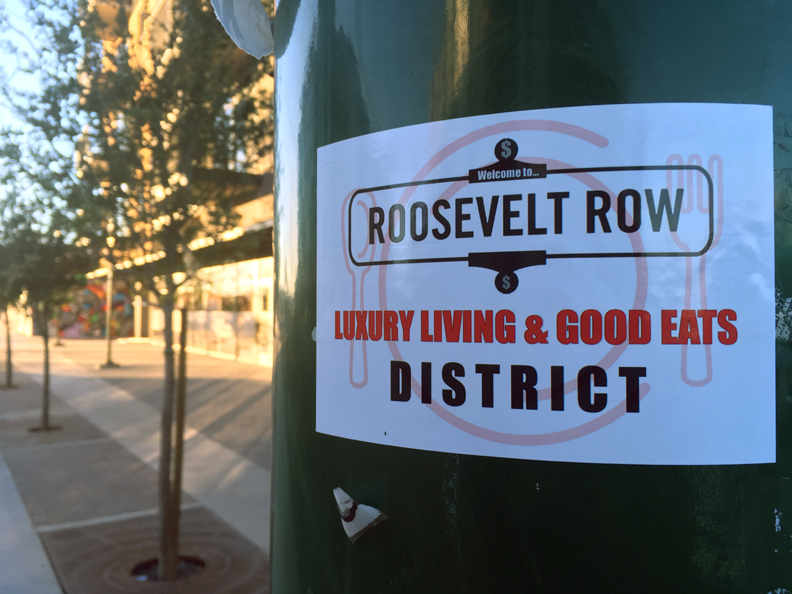 Ultimately, Roosevelt Row has turned into an “entertainment hub”, just one of several in the downtown core, one that focuses on “music and the performing arts, with a spotlight on the visual (arts)”, where the signature events are the annual Chili Pepper Festival and a Pie Social. It’s not dissimilar to what’s happening on West Van Buren, where music and the performing arts are coalescing in several venues slated to open in 2017. It’s an alternative to the sports-centric Legends Entertainment District. It’s not unlike the restaurant/retail entertainment hub we see taking root along (and around) Central Ave, primarily between Adams & Jefferson streets. 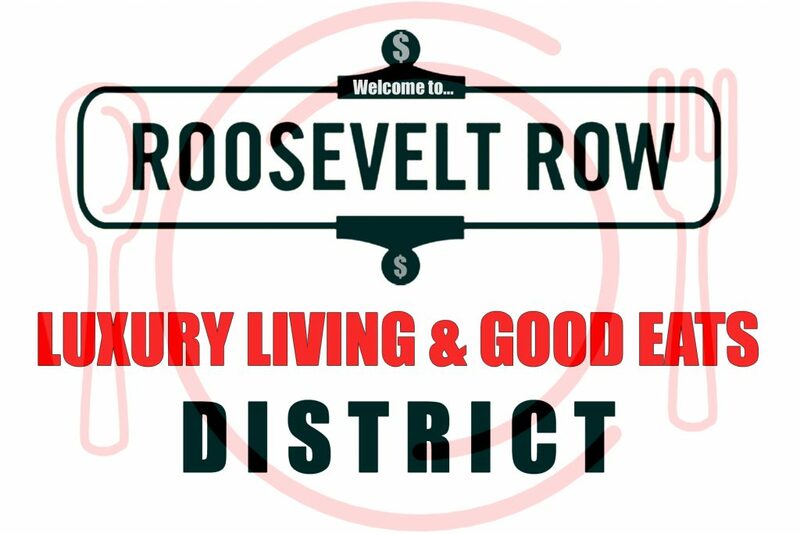 Continuing to call Roosevelt Row an “Arts District” at this point might be the greatest bait-and-switch scheme Downtown Phoenix has ever witnessed. How does it compare to your other projects, such as Shiny Happy People Happening? I really liked that project, btw, and Parasite Park. I’m a big fan of ephemeral, barely noticeable street art on a macro scale. I’m super into tiny worlds all around us that aren’t noticed. Do you know if any figurines still exist? All my street art projects start with the premise that “downtown is my canvas”, and are primarily done with materials (like wheatpaste paste-ups and sticker art) that weather away within six months. Much like downtown itself, nothing is permanent, and will be “re-invented” with the next project. Have you received any feedback from artists, venue owners or politicians, etc? What kind of response are you hoping for? 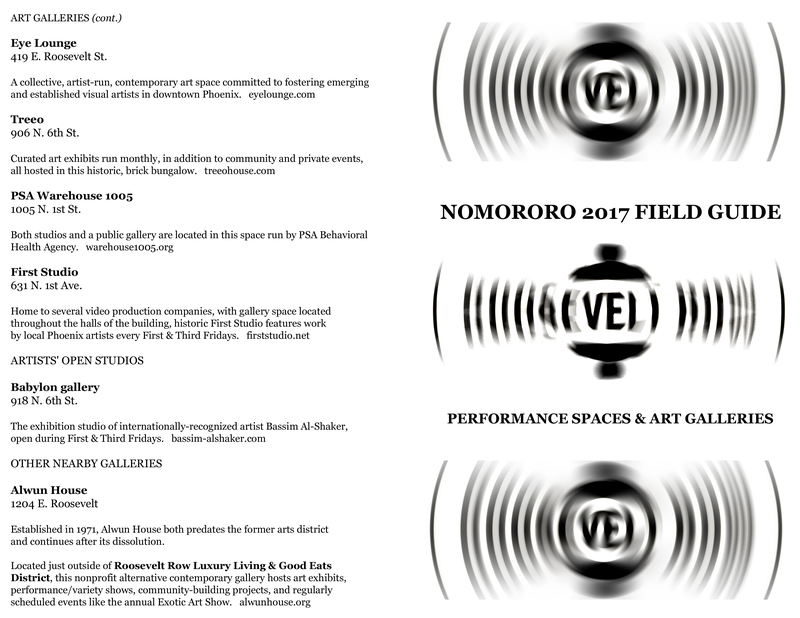 A few venues (MonOrchid, Modified Arts, The Trunk Space) “liked” the NoMoRoRo 2017 Field Guide on Facebook, but overall the response has been muted. But the project wasn’t designed for a huge, immediate response. Thousands of people saw the sticker art during December’s First Friday, and made a mental note of the new signage on a majority of street poles in the area, and the brochure was available at listed venues. Now we’ll see how things play out in the new year, with the introduction of these subtle truths hidden in plain sight. So what makes an arts district an arts district? I know it’s a more complicated answer than ’the artists’ or just an area of town that has lots of murals. I want to know how you define it. An arts district is where a critical mass of artists end up living, and working on their craft, because the area is affordable. Yeah, that doesn’t sound like Roosvelt anymore. 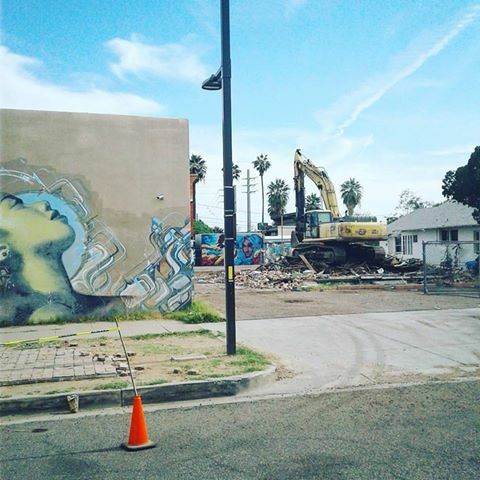 If the arts district has to move (again), where do you think it will go? Or should I not ask that if it should remain underground? There’s a few areas outside the downtown core where artists are gravitating, but let’s hope they never market any of it as an “Arts District” because that’s tantamount to blood-letting in shark infested waters, by attracting luxury development (to the area). At which point, it’s all over. In New Times, you said “”Phoenix can’t afford to wait another 20 years to get our cultural identity right.” What, to you, is Phoenix’s cultural identity, if any, and how do we cultivate that? Phoenix is still figuring that out, and it may take two more decades to find an answer. Sigh. Someone recently described Phoenix to me as more yuppified, filled with more corporate chains. Do you agree with that? BTW, how can people get their own stickers or learn more about the project? There are no souvenirs, short of taking a picture when you see one plastered on a street pole. You can read the brochure yourself here. Click images to enlarge. 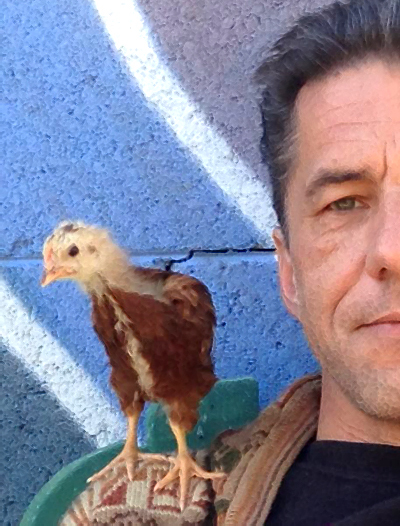 Pete Petrisko is an artist, musician and activist. More info can be found on his artist page. Troy Farah is a journalist from Phoenix. Follow Troy Farah on Twitter.